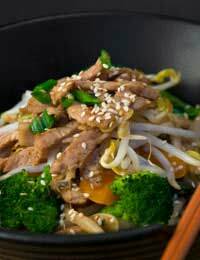 Sesame pork and noodle salad is a great dish for serving those who think salads consist only of ingredients such as lettuce, tomato and cucumber. The twist on the traditional salad will hopefully persuade those that think of salads as boring to think again and give them a try. 200g of pork fillet, the leaner the better. Once you have collected all the ingredients you should first remove as much fat as possible from the pork before slicing the meat into sections of about 2 inches in thickness. Next you take the pork and slice it again into thin strips. Once you have dealt with the meat you can turn your attention to the garlic, ginger, sesame oil, soy sauce, vinegar and sherry. Place all these in a large bowl before adding in the pork, which should then be mixed until it is coated with the other ingredients already in the bowl. It is important to do this part of the preparation first, as it gives ample opportunity for the pork to marinate as you carry on with the other stages of the salad's preparation. Next, take a large bowl and place the egg noodles inside. After you have done this add boiling water, ensuring that the water completely covers the noodles. You should then leave the noodles to soak in the boiling water for approximately 7 minutes. By this time the noodles should have become tender, but it is best to always confirm this yourself. Once the noodles are tender remove from the water, and remove all excess water from the noodles, before placing the noodles in the bowl and adding the spring onions, bean sprouts, carrot and red pepper. Next you should boil a pan of water and place the mange tout in it and boil for approximately 1&1/2 minutes. By this time the mange tout should still be a little crisp but on the verge of becoming tender. Once you have completed this remove all excess water from the mange tout and hold under a running cold tap for approximately 30 seconds. This will help refresh the mange tout. Once the mange tout has been refreshed you should mix it with the vegetables and noodles, ensuring that you mix it well. After this place it to one side for a short while. You now need to take a large frying pan and toast the sesame seeds using a medium heat for approximately 2 to 3 minutes, making sure that you continually stir them during this time. By now the sesame seeds should have taken on a golden brown appearance. Once they appear golden brown, remove the sesame seeds from the frying pan and place them on some kitchen paper. Next, take the frying pan and increase the heat slightly before adding the pork to the sunflower oil already in the frying pan. The pork should then be stir fried, in its marinade, for approximately 7 to 9 minutes. A good indication of when the pork is cooked enough is when it loses its pink appearance. Once the meat has been cooked, add it to the vegetable and noodle mixture, ensuring that it is stirred well as you add it. Once you have served the salad top it off with some sesame seeds.